I've never had my brows waxed. I've actually never had any part of my body waxed, come to think about it; sure, I've waxed my own legs and so on, but somehow the thought of someone waxing me just doesn't appeal to me! Equally, I've never had my brows professionally shaped in any way, tinted, dyed, anything; no-one except me has ever done anything to my brows! I've never bought a Benefit product. I've never had my nails done. 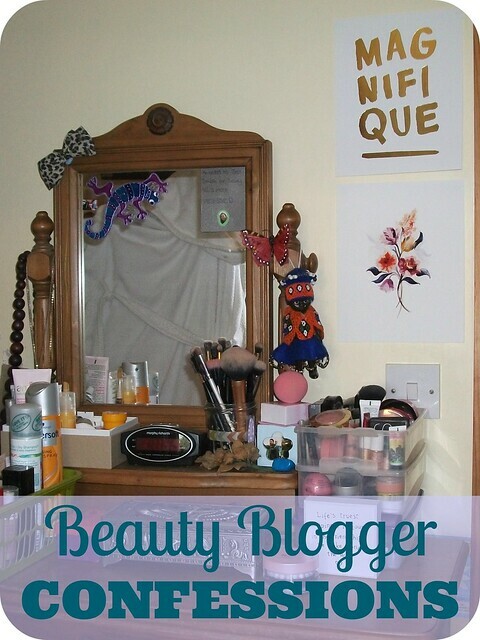 Wow, I really am a dreadful beauty blogger, aren't I!? I've never had my nails done - at the moment, there'd be no point as I can't wear nail polish at work, but even before getting my current job, I never bothered for a few reasons. I never wore the same nail polish for more than a couple of days, so it would seem like a waste of money in that respect, and doing my nails is something I really enjoy - so it's never made sense to pay someone else to do it for me!! I've also never worn false nails - but that's mainly because I have abnormally long nail beds and have never actually seen any false nails that are long enough. I don't own a single item from Cath Kidston. Cath Kidston is one of those stereotypical blogger brands but I don't own a single item; worse than that, I think the brand is massively over-rated! Sure, they have some pretty things, but I really don't think they're all that - and they are definitely waaaay over-priced. See also: IKEA. I don't own anything from IKEA. This is mainly because there isn't a store locally and they charge a small fortune to deliver to my area. I don't use eyelash curlers. This is partially because I had a bad experience with a cheap pair when I was younger, where I actually sliced half my eyelashes off altogether. It's also because I'm lazy and can't be bothered with the extra step. Also, my lashes are naturally pretty long and hold a curl nicely, so I'm lucky that I'm happy with how they look without the faff of eyelash curlers - which reminds me of my German teacher back in high school finding a pair once and declaring that they looked like an instrument of torture - I quite agree. I don't own a Canon camera. Nor even a Nikon. My camera is a Fujifilm point-and-shoot thing I bought second-hand off of eBay for around £20. It's not brilliant, by any stretch of the imagination, but it does the job and until I can afford to replace it, it will continue to do so. The benefit of having a cheap camera is that I'm not paranoid about taking it places with me - I know how clumsy I am, so the thought of taking a £500 camera anywhere with me is mildly terrifying. I've dropped my Fujifilm countless times and it's survived beautifully! There are no fairy lights in my room. I'll be honest, I do love the way fairy lights look; they're so pretty & girly, I would love to have some in my room... But seriously, our house gathers dust like you wouldn't believe (we have a large dog and an open fire...), so once again this comes down to my laziness - I can't imagine having to dust fairy lights! There are plenty of things I'd far rather be doing with my time. I've never had a macaron. So, now you know the truth about me and my beauty blogging shortcomings... Do you have any beauty blogger confessions to make? Any stereotypes you aren't living up to? I'd love to hear!! I love reading these posts. I've never owned any Cath Kidston either, and i've never used eyelash curlers before. I wouldn't even know how to use them! Gosh! This post is truly me.. LOL :P I have no fairy lights on my room too, and I have no Canon or Nikon SLR.. I don't have Benefit products, but the travel size..
aah ok, I don't have those lights hehe. I hardly have regular light bulbs, 2 of my regular lights in my living room needs to be replaced... I'm so lazy hehe. I love this! So many of these apply to me too, although I have a little Canon s120 and I love a bit of Benefit Hoola! I really like reading these type of blogger confession posts! I am guilty and have partaken in pretty much all of these minus the fairy lights...although I would like some in my new room eventually haha. During middle / upper school I never had to do anything with my eyebrows - wish my brows would behave like they used to! Thank you for shedding some light on this issue! There definitely are stereotypes surrounding beauty bloggers, but they don't always apply to everyone! Some of the above you mentioned are true for me (I own more Benefit products than I dare admit, and I enjoy getting my eyebrows waxed), but my messy room is not at all Pinterest-worthy, and while I do own a Canon camera, it's a $200 point-and-shoot, lol. People have certain mindsets about beauty bloggers, but it's only because of a handful who are able to afford that lifestyle. They don't realize that, beneath the gold and glitter, we're all just your average Jane writing about what we love. haha I need to do this! Can't believe you've never had your nails done and YES you MUST try macarons because they're amazing. The rest is probably okay and things you can live without doing haha.